The registration for this tour will close on April 1, 2019. AM: Arrive Accra, capital of Ghana. Transfer to hotel for check-in and rest. PM: Briefing and orientation. 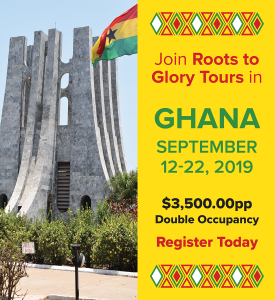 Half Day Accra City Tour. Overnight Accra. Depart Accra for TAMALE, believed to be the fastest growing city in West Africa (one hour by air). Continue to Bolgatanga, the regional capital of the Upper East Region, by road. Visit the crafts market. Dinner and overnight Bolga. AM: Spend the morning with members of the Sirigu Women’s Organisation for Pottery andartworkWOPA) who are involved in pottery, weaving artwork, and unique symbolic wall decorations. A tour of the village includes a courtesy call on some community elders. PM: Visit the Paga crocodile pond and Nania Slave camp. Return to Bolga for overnight. Depart Bolga for Tamale with appropriate village stops. In Tamale, visit some traditional industries operated by women. Overnight Tamale. Depart Tamale for Kumasi. Make appropriate stops including Kintampo Waterfalls, and Techiman market. You will enjoy the transition from tropical savanna in the north to the rainforest in the middle belt. There is also the change in architecture. Overnight Kumasi. Depart Kumasi for Elmina. Your stops will include a cocoa farm, the Slave River where the enslaved had their last bath before being sent across the Atlantic. Tour Cape Coast Castle. Overnight Elmina. Visit Elmina fish market. See fish processing. Depart Elmina for Accra for overnight. Another payment of $1500 is due on or before March 1, 2019. The balance of $1500 is due April 1, 2019. If using Paypal, there is a fee of 4% which will be collected at the final payment. THE DEPOSIT OF $500 IS REFUNDABLE WITHIN 30 DAYS OF PAYMENT ONLY. WE STRONGLY SUGGEST THAT YOU PURCHASE TRIP INSURANCE AS SOON AS POSSIBLE BECAUSE ONCE THE AIRLINE TICKETS ARE PURCHASED THERE WILL BE NO REFUNDS. www.squaremouth.com for insurance.